Serving the Illinois, Indiana and Michigan area, at Expedition Log Homes we believe that your log home is not just an address, it's a way of life. That's why every Expedition Log Home is custom designed and tailor-made to your specifications. We can show you how to adjust any log home design to meet your individual taste and budget. Whether you are planning to "break ground" now, or in the future, we'll be here to guide you along the way. To take your first step, call Stan Fryzel at (219) 663-5555 and let the jouney begin. 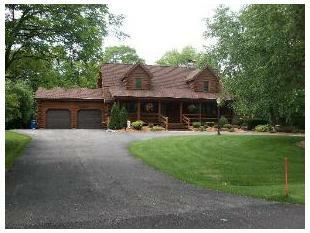 The above custom built log home has been Sold! a custom log home or log cabin for you! Serving the Illinois, Indiana and Michigan area. Copyright . Stan Fryzel. All rights reserved.